Special Containment Procedures: Five instances of SCP-2584 are to be kept in a warm, dry enclosure of appropriate size in the Parazoology wing of Area-12. When an instance of SCP-2584 undergoes binary fission, one of the offspring is to be euthanized and disposed of. Description: SCP-2584 is a species of snake that has been classified Oxyuranus ouroboros. SCP-2584 is closely related to the species Oxyuranus microlepidotus, from the genes of which it may have been engineered. 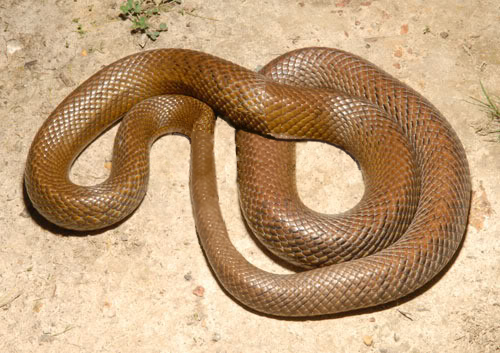 SCP-2584 is solid brown in coloration, and approximately 7cm to 10cm in thickness. SCP-2584 has no head or tail as its body forms a continuous closed loop. Otherwise, SCP-2584’s tissue and anatomy is completely normal, save for its circular spine, circulatory system, and digestive tract. SCP-2584 is able to achieve locomotion, but has no brain, sense of sight, hearing, taste or smell, and thus is only capable of reflexive movements to flee from danger after injury or move towards warmer areas. Otherwise, instances tend to remain still or spin in place. As SCP-2584 can neither eat nor breathe, the source of SCP-2584’s energy is unknown. The digestive tract of SCP-2584 cycles the same matter continuously, but is somehow able to gain metabolic energy with each cycle without expending any of the nutrients. SCP-2584 grows in length at a rate of approximately 1.4cm per week, and the contents of its digestive system have been found to increase in proportion to its size. When SCP-2584 reaches a length of around 220cm, it undergoes asexual reproduction. The process begins with SCP-2584 spasming to cause half of its body to form a half twist, assuming a figure eight posture. Then, over the course of 2-3 days, the overlapping portions of SCP-2584’s body will shed its scales and dermal layers at the place of contact, and eventually become adjoined. Finally, over the course of 7-9 days, the internal anatomy of the adjoined area will modify to form two distinct loops, and SCP-2584 will separate into two distinct organisms of half the length. This reproduction takes place approximately once every eighteen months. As this method of reproduction introduces no genetic variation, all instances of SCP-2584 are clones. Addendum 2584-1: Due to SCP-2584’s abundance, harmlessness, and ease of maintenance, the Department of Parazoology has decided to allow a limited number of Area-12 personnel to apply to obtain instances of SCP-2584 to keep as on-site pets. Owners must properly enclose and supervise their instances, turn in one of the offspring upon fission, and promptly report any unusual behavior. This is a privilege that may be revoked without warning at any time. Addendum 2584-2: On 7 Nov 2014, Dr. Jept reported that his pet SCP-2584 was reproducing strangely. The specimen was returned to the Parazoology wing for observation. After division was complete, it was clear that the two daughter specimen underwent fission in such a way that they ended up linked. Both specimens were kept alive for study.